People who have severe movement disorders like Amyotrophic Lateral Sclerosis (ALS) or Locked in Syndrome, is a condition where a patient is awake and aware of its surrounding but unable to communicate or perform any action due to paralysis of almost every voluntary muscles in the body (with the exception of eye movements and blinking). The people who are suffering from severe Cerebral Palsy disorder are not able to speak or not understandable enough so they could not communicate, navigate and interact with others.ALS patients, paralyzed patients, Physically Challenged and Old age .These people also have severe movement disorder .Imagine these patients having a fullyfunctional brain trapped within a non-functioning body. This project is dedicated to them formovement, communication and emergency alert for their caretaker. The primary objective of this project is to develop an intelligent low cost brain and eye controlled wheel chair with communication interface system so that user can communicate by using eye blink detected from brain waves and same can be used control the wheel chair. To achieve maximum reliability and minimum cost, wireless connectivity is to be used as far as possible. To deliver a user friendly system, it is planned to develop an Android OS or Embedded windows based human machine interface. The wheel chair and the entire system is battery powered and can be recharged and used in any Indoor area. At the end of the project the following goals will be achieved. 3)To design a text to speech converter so whatever keys typed can be sent to a speaker or an SMS to the care taker. 5)To design and develop an Omni directional Wheel Chair capable of recharging and handling a payload of 120 Kg. 6)To develop Lidar and Camera based Obstacle avoidance and Computer Vision system for smooth navigation of the wheel chair. 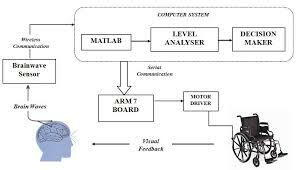 7)GPS based Path learning system based on Neural Networks It should be noted that the main objective of the project is intended to evaluate the ability of individuals to voluntarily control the wheel chair through their brain and eye activity, being necessary to ensure that the orders are executed properly. The overall objective is to build a relatively inexpensive, easily deployable intelligent wheel chair where user can control and communicate using this hardware.